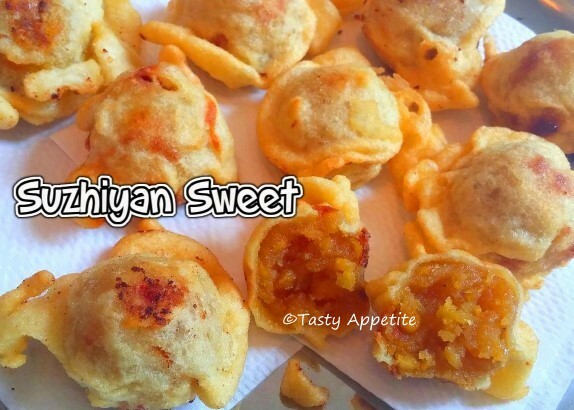 Suzhiyan or Seeyam is one of everyone's favorite Diwali Special Sweet Recipes. This authentic delicious dish tastes scrumptiously tasty with crispy outside and soft chewy inside. We used to prepare this traditional sweet during Diwali along with Idly & Vada for pooja. In this recipe, the jaggery puranam is prepared and coated with maida flour batter and deep fried in oil. The left over puranam can be used for making poli too. Try this delicious sweet dish with this simple video procedure & lemme know your precious feedback. Wash and soak chana dal ( kadalai paruppu) in water for 5 mins. Take a blender add cooked chana dal and jaggery powdered. Add grated coconut and saute for 2 mins. Add jaggery mixture and toss well in low medium flame until the mixture thickens. Add cardamom pwd and give a good stir. Add maida flour and besan flour to mixing bowl. Add water little by little and mix to smooth paste. The consistency of the batter should be not too thick or watery. It should be flowing consistency as shown in the video. Now make small balls out of the jaggery mixture. Take a ball and dip it in the batter. Drop it in the hot oil and keep the flame in low medium. Repeat the same for all the jaggery balls. Fry the suzhiyan in batches. once the suzhiyan turns golden brown and crispy, drain from oil in kitchen tissue. Authentic delicious Suzhiyans are ready with crispy outside and chewy sweetness inside. Enjoy warm and celebrate the festive moments.